In this movie at least, Loren Avedon resembles Scott Baio. Sean Donahue bears more than a passing resemblance to pre-Bibleman-era Willie Aames. Coincidence? 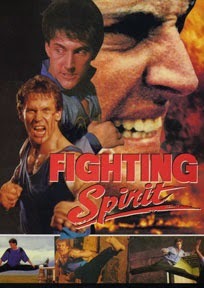 Fighting Spirit could very well be the Charles in Charge - or Zapped!, if you will - of early-90’s low budget Punchfighting movies. This is actually one of the better Avedon outings, he’s not unlikable like he is in some other efforts. His character even goes through something of an arc, from smug non-fighter to full-fledged action hero (though it is odd that on the first day of his training, he can already do Van Damme-style splits). And, adding to the feel that this movie is a lot older than it really is, the two of them train to disco music. The music, generally speaking, is pretty weird. There are a ton of misplaced cues, and a lot of it (which repeats over and over) even seems out of tune. The main theme appears to be nothing more than a slow pick slide over a lightly-amplified electric guitar. So when you’re not distracted by the music, you can concentrate on the funny dubbing. Once again, those loud or wacky voices appear. Either the music or the voices are blaring at all times: one of the main positives of the movie is that it is almost non-stop fighting. There’s a fight scene seemingly every few minutes, which keeps the attention up. Sure, it’s all pretty downmarket, but it’s also fun most of the time. It doesn’t seem like the filmmakers were working with the best equipment, but maybe that’s all they had in whatever foreign country they were in. Our guess is the Philippines, due to the presences of Nick Nicholson, Ned Hourani, and a bit part by Mike Monty, though fellow Philippines-shot movie mainstay Henry Strzalkowski isn’t present. Monty gets raving drunk in the first scene of the movie and isn’t seen again; Nicholson is a kickboxing coach who is constantly barking orders at his charges and calls everyone “boy!” All that being said, a police officer identifies himself as “LAPD” - are we supposed to believe this is all taking place in Los Angeles? But silly details like that add to the enjoyment of the movie. There are not one, but TWO ideas lifted wholesale from Cape Fear (the then-recently released 1991 version, probably), and the Punchfighting audience Billy must fight in front of is rather small, especially for such large sums of cash that are on the line, but, as we’ve said before, there are many kinds of stupid, and not all stupid is bad stupid. You might say Fighting Spirit is more confused than anything else, because it seems a lot of the wackiness/dumbness resides from its strange take on what someone believes to be American life, and mind-numbing scenes ensue. Once again, that is not a negative criticism. We don’t know the country of birth of director John Lloyd, but thanks to this movie and his Ron Marchini vehicle Ninja Warriors (1985), we do know he certainly has an off-kilter sensibility. Despite all odds, it’s actually pretty darn entertaining. Featuring the lounge-type song “Why Must This Be” by Harry Strong, Fighting Spirit may be a bit grimy, but you just have to either enjoy it or look beyond it. 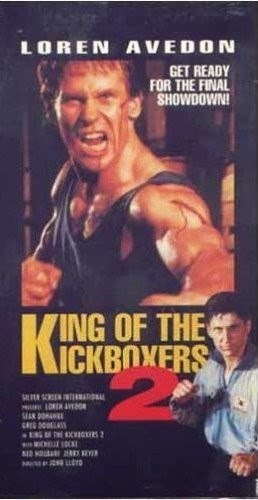 Confusingly, this is also known as King of the Kickboxers 2, presumably because of the presence of Avedon, but it has nothing whatsoever to do with the earlier Billy Blanks romp. Also check out a write-up from our buddy, Fist Of B-List! This was an OK movie. The "grimy" and extremely low-budget look of the movie certainly harms it. I agree with you that it was shot in the Philippines, since Monty is in it. Other Avedon films I would recommend are Deadly Random, Operation Golden Phoenix, Virtual Combat and The Circuit. Roger: Something about this movie's weirdness won us over. Haha. Got to love Monty. Venom: A review of Virtual Combat is coming up soon!